We provide different shapes of Circular, Square, Rectangular covers with some sizes of each for the usages in the civil,residencial and industrial construction. Wuzland® square and rectangular BMC manhole covers were EN124 approved, their quality is compliant with or higher to the SABS SANS 1882:2003 standards. 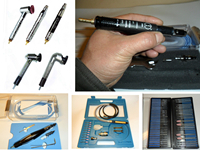 Different kinds of safe and accurate pen grinders are the artists and engineers' choice specialized in sculpture, design, polish and grind for mould, glass, stone and crafts. Clothing, footware, hardwares, electronics, Chinese medicines and health products (OTCs) used to be our main business in retails and wholesales. Electronic Cigarettes, the green products of new technology which replace the traditinal cigarettes for smoking become more popular today by their advantages. By our more than 10 years experiences in the businesses of agency, flats management, building projects and property devolopment, we provide services in these areas. As a trading company, we have the retailing and wholesaling businesses for our own products and the others. We do the marketing of products in South Africa and Africa. Afrasian Business concentrates on Chinese and South African businesses. Any projects or part of which related will be interested by us to participate. Quote Us Now for Very Competitive Prices!